I am in a seriously fatalistic place tonight. I’ve concluded our country is doomed: that the great capitalist democracy experiment, so eagerly and thoughtfully launched nearly 250 years ago, has been a colossal failure thanks to drunken greed, and power in the hands of fewer and fewer self-interested people; that our deeply polarized government has all but ceased to function; that political campaigning has become nothing but a moronic, embarrassing side show of freaks and clowns; that the NRA, in arming a critical mass of non-critically thinking gun nuts with a quarter billion guns, is preparing for a revolution and could just pull it off; that compassion, integrity, intelligence, tolerance and common sense have left the room…. and I’ve been assuaging my despair with Wheat Thins–too, too many Wheat Thins. I could go on. I’m really, really unhappy about it all. I just want Peter to have a good life. And his kids. And my greats, whom I’ll not meet. But oh dear.. what have we wrought? I thought maybe some quotes would help. Here are some favorites… one that inspires me to make my own peace, one that inspires me to find my own joy, and one that gives me a wee bit of hope. In that order. 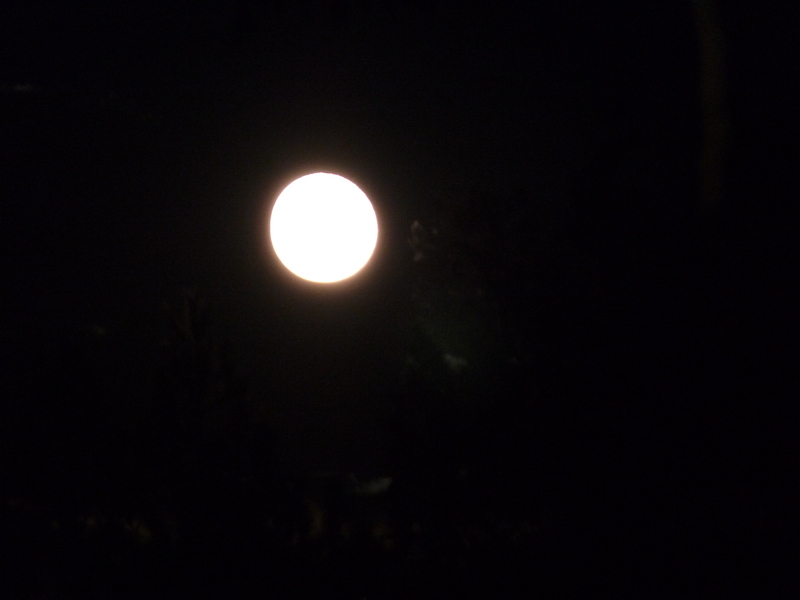 Picture taken of the big fancy super moon a couple weeks ago, the day after the fancy total eclipse, from our driveway. With my good camera, but without a tripod.